Plotting, obliqueness and The Massacre of St. Bartholemew’s Eve (1966) | Randomwhoness: a Doctor Who blog by Johnny Spandrell. Sampling stories in random order. What a crazy rollercoaster ride watching Season Three on transmission must have been. Only the week before the first episode of The Massacre of St. Bartholemew’s Eve (hereafter The Massacre) went out, the series was disintegrating Daleks for us on exotic alien planets. In the coming months there’ll be the high concept sci-fi of The Ark, the surreal fantasy of The Celestial Toymaker and a musical Western in The Gunfighters. And in the middle, the dry old history book of The Massacre. Blimey, who on earth is this show’s target audience? Last time, I pointed out The Power of Three‘s failure to explain a few crucial plot points, and promised there was a howler of an example coming up in this post. Given that hint, I doubt if many people would have guessed I was talking about The Massacre. Partly because this story’s a particularly obscure one, and partly because it’s garnered a surprisingly strong reputation for a story nobody’s seen since 1966. Surely The Massacre‘s a quality story? It wouldn’t play us false. The thing about The Massacre is that it seems worthy. It’s Doctor Who‘s costume drama, it’s Armchair Theatre. It must be good. And it is, but it’s by no means perfect. And it’s a bit of a stretch to call it ‘arguably the best ever Doctor Who story’, as Cornell et al did in The Discontinuity Guide. There’s a tendency to be a bit too kind to The Massacre, because it feels so different to the rest of the series and because it’s more cerebral than most. This is the thinking fan’s story. But to the howler. In the first episode, the Doctor visits apothecary Charles Preslin (Erik Chitty) where he learns of the recent arrival in Paris of the Catholic Abbot of Amboise. Preslin is a Huguenot, and fears that the arrival of the hawkish Abbot spells bad news for his kind. So much so, that he’s shutting up shop and moving out. The Doctor is intrigued and wonders about visiting the Abbot. The next we hear, the Doctor has gone on a mysterious mission, as Preslin outlines to a young boy. PRESLIN: You showed the old man the way? Good. I only hope he succeeds. You were not seen? Let’s hope not. You’ve done well. Good luck, old man. Good luck. So the Doctor’s off on a mysterious mission. And he doesn’t come back until the final episode. Until then, Hartnell plays the Abbot, because this is a doppelgänger story and he is a dead ringer for the Doctor. 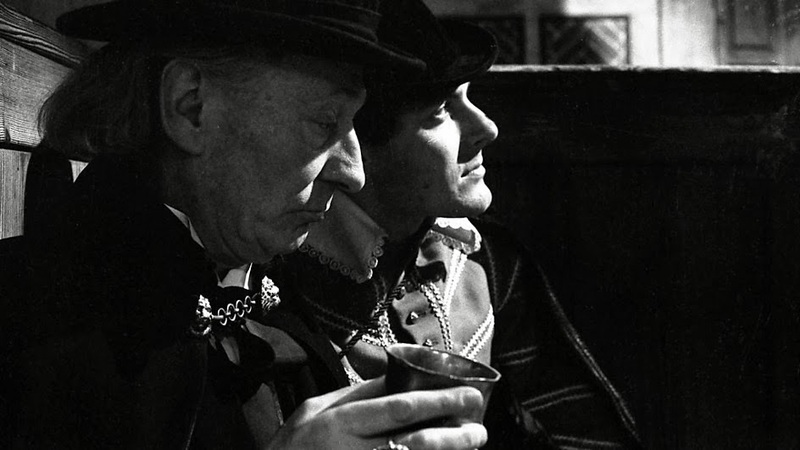 This causes no end of grief for companion Steven (the ever reliable Peter Purves) who bounces between Huguenot and Catholic protagonists, and earns the suspicion of both as he tries to work out if the Doctor is impersonating the Abbot. At the end of the third episode, the Abbot has botched an assassination attempt, fallen foul of scheming Marshal Tavannes (Andre Morrell, he of Quatermass and the mellifluous voice) and is murdered. Thus Steven believes the Doctor to be dead, and early in the fourth episode returns to Preslin’s shop to look for the TARDIS key. Was the Doctor impersonating the Abbot? DOCTOR: I told you not to get involved. STEVEN: Look, I tried not to, but the Abbot did look like you. If he wasn’t impersonating the Abbot, then where was he and what was he doing? And to this there is just no answer. The closest we get is the Doctor saying he was ‘unavoidably delayed’ and you’d think Steven deserves a better explanation that that. So what was this mission that Preslin said he was on? Was it simply finding his way back to the TARDIS? Anyway, it would be unthinkable for a modern Who story to drop its lead character without explanation for half the story. But in The Massacre‘s case, it makes a difficult-to-penetrate story even harder to fathom. If you’re not familiar with the tensions between the ruling Catholic elite and the Protestant Huguenots in the 1570s (and I wonder how many schoolkids watching this on transmission in 1966 would have been), The Massacre doesn’t go out of its way to help you out. Other historicals like The Aztecs and The Crusade at least give us a villain to side against with our heroes. But here, Steven is equally alienated both from the Catholics and the Huguenots. In its quest to demonstrate the complexities of religious conflict, The Massacre gives us no one to barrack for and against, at least not until the final episode, when Tavannes and Queen Mother Catherine de Medici (Joan Young) launch the massacre itself. Then there’s the complexities of its ideas. What would young viewers have made of its Doctor-less second episode, in which Steven learns of the Catholics’ plot to kill ‘the sea beggar’. After various debate between factions, the episode ends with Huguenot leader Admiral de Coligny (Leonard Sachs) revealing that due to his sympathies to the Dutch in their conflict of Spain, he has become known as ‘the sea beggar’. Which means, it’s him! He’s the target! And um, what does that mean again? It’s hard to imagine the young’uns on the edge of their seat for that lot. As cliffhangers go, it’s hardly a Dalek emerging from the Thames. If I could have one episode on this story back from the dead, I’d choose the third, Priest of Death. It’s the episode which features Hartnell as the Abbot the most, but it also has what sounds like a brilliant performance from Barry Justice as Charles IX. He’s so bored he can’t even face talking about his own nation’s impending war with Spain, something which might have warranted some attention you’d think. But spoilt King Charles would rather play tennis. He’s the one Catholic who’s sympathetic to Huguenot de Coligny, so you’d expect him to be outraged when he hears of his murder. And so he is, but he has to be dragged from tennis court to royal court to hear the news. His reaction is deliciously petulant: “Will I never have any peace? !” Tennis players. They’re notoriously touchy. But if we’re playing the ‘rescue one episode’ game, there’s also the fourth episode, Bell of Doom to consider. It contains the famous scene where Steven, sickened by the Doctor’s decision to leave serving girl Anne Chaplet (Annette Robertson, who plays Anne with a Somerset accent so we all know she’s working class. French accents being optional throughout the story.) behind amidst the massacre, angrily quits the TARDIS. It’s a groundbreaking scene; never before has a companion so roundly criticised the Doctor and backed it up by leaving him. It’s influential too; we can see the modern day equivalent in Kill the Moon and the same argument played out to a different result in The Fires of Pompeii. But ultimately, the praise heaped upon that scene is another example of us being a little too kind to The Massacre. Because the outcome of that scene is… nothing. Steven reboards the TARDIS minutes later, and the dispute given no more air time. It was an empty threat for sure. But there is a nice touch at the end where the TARDIS materialises in 1966 specifically to pick up Anne’s maybe descendant, Dodo (Jackie Lane, debuting here). Given the erratic nature of the TARDIS’s navigation, surely this is one coincidence too many. Perhaps the destination was chosen by the TARDIS in response to the argument between Steven and the Doctor, in order to settle the quarrel. How random to find in this history lesson of a story an early indication of the time machine’s sentience. LINK to The Power of Three: both feature ancestors of companions. NEXT TIME: Slag, ash and clinker. They are the fruits of The Mutants.